← How to convert files of AutoCAD to fax? How to convert files of AutoCAD to jng? JNG is an image file format related to the .PNG format, but it uses lossy compression like standard .JPG files.JNG format file is developed as a sub-format for .MNG objects, but it can also be used as a standalone raster image format. JNG files may include an optional alpha channel for transparency ,which is not supported by standard JPEG files. They may also include ancillary data chunks that can contain color-space information and comments. If you want to convert AutoCAD to jng format file, docPrint Document Converter Professional will be an expert. Because docPrint Document Converter Professional is a software product that dynamically converts MS Office 97/2000/XP/2003/2007, WordPerfect, AutoCAD DWG, PostScript, Adobe Acrobat PDF and many other document types to Adobe Acrobat PDF, PostScript, EPS, XPS, PCL, JPEG, TIFF, PNG, PCX, EMF, WMF, GIF, TGA, PIC, PCD and BMP etc formats. With docPrint Document Converter Professional you can convert your documents from and to 50+ formats easily. You can call docPrint Document Converter Professional as docPrint Pro for short. In essence, there are three available applications in docPrint Pro and docPrint is one of them. The three applications are GUI application, command line application and virtual printer application which is consisted of docPrint and docPrint PDF driver. In this article, you will see how to convert AutoCAD to jng format file with the printer docPrint. Please don’t take it for granted that docPrint Pro is the same to docPrint. You should make it clearly. Here are the very steps and you can follow them. Right click the file and choose “Open” option in dropdown list. 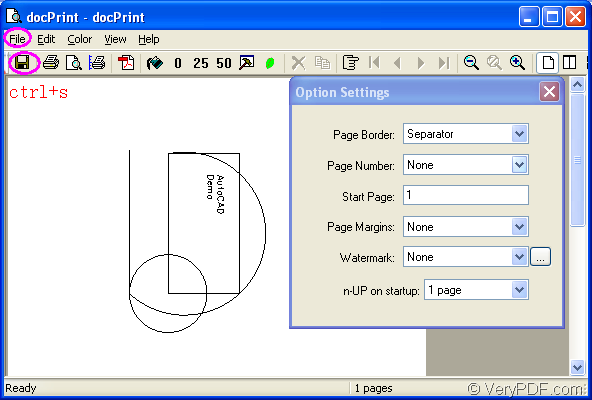 Click “File” and click “Plot” in the opened dwg file and choose “docPrint” as current printer in “Name”combo box of “Printer/Plotter” group box in popup “Plot-Model” dialog box. The quick way—the hot key “Ctrl”+ “P” can also open “Plot- Model” dialog box. 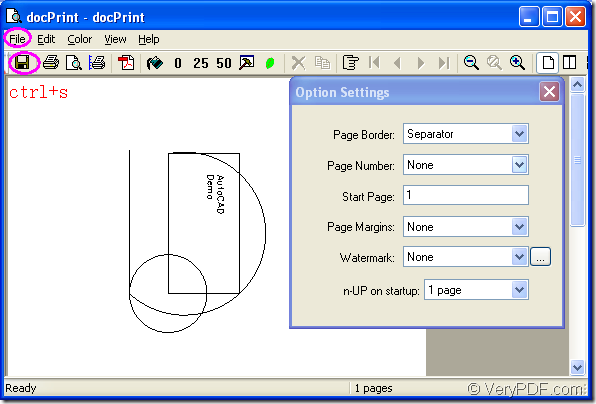 If the docPrint is default printer, you don’t need to open the dwg file, just right click it and click “Print” option. Then in “docPrint” dialog box, you should do following operations to open “Save As” dialog box in which you can save your target file and run the conversion. Please see Figure1. Click the icon which stands for “save file”. In the last dialog box “Save As”, you can set the target file like the tips below, please see Figure2. Find a suitable location for the target file in “Save in” combo box. Define a name for the target file in “File name” edit box. Choose a right output format for the target file in “Save as type” combo box. For example, here you should choose “JNG File(*.JNG)”. After the conversion of AutoCAD to jng, you can find your target file in your computer. Now what you need to do is trying it yourself. You should know that doing wrongly at least ten times is productive than doing nothing! We also know another saying that practice is a good teacher. So trying it, you will find the joy in the process. How to insert image file to my PDF file and make image file also searchable? How to convert documents of Microsoft Office Word to WBMP?